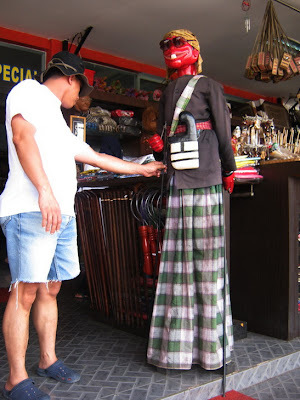 I saw this tall version of Cepot wayang (puppet) in a rest area, in the front of handy craft store. I like his funny face. His one big front tooth makes his funny face more impressive. Cepot is a very popular character of Sundanese puppet (West Java, Indonesia). His characters are humorous and playful to anyone, either to the knights, kings or gods. Nevertheless, through his humor, he still conveys advice, counsel, and criticism. 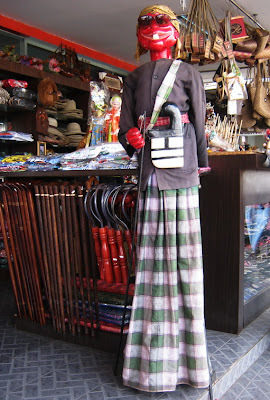 His figure usually issued by a dalang (narrator and puppeteer) in the middle of the story. Always accompanies the knights, especially Arjuna, the Knight of Madukara who becomes his master. Cepot used by the dalang to give messages to viewers and spectators with humorous way. In a fight or war, usually Cepot participates with a bedog weapon (a kind of knife). In its development, Cepot also have arrow weapons. The denawa (the giant) used to be his opponent. Its presence in every puppet show is always waited because of his fun character. Many puppeteers use Cepot as main figure in every performance.